This month I will be concentrating on the idea of 'Beauty is Your Duty'. 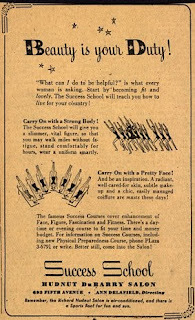 The concept of Beauty is Your Duty came around in the second world war as a morale booster. Women were encouraged to put their best face forward and not let the war affect how glamorous they looked. 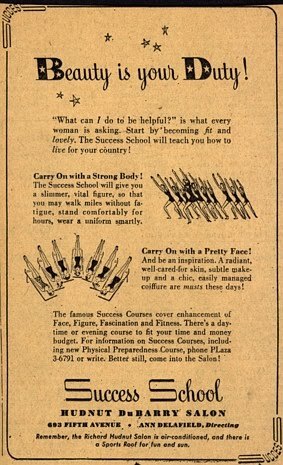 Despite rationing and many products not being available such as make up and stocking women found ingenious ways to stay glamorous under difficult circumstances. We will be exploring these methods of staying glamorous in the first week this month. The second world war was the first time that women had really entered the workforce and took on jobs that were traditionally considered male roles. This led to many constraints being put on women with regards to the way they looked and the time the had to maintain their glamorous image. Shorter hairstyles came in vogue as they were more practical for women working in factories and other physical jobs. They were also easier to maintain at a time when main styling products were unavailable and even water was rationed to 5" in the bottom of the bath. In the second week I will be conducting a kind of experiment by following a wartime wives hair routine for the week and bringing you updates everyday. Weeks 3 and 4 will bring you even more beauty related information and I'm sure a few mishaps from me so stay tuned for a glamorous month as I vow to put my best face forward!